Creating your website is undoubtedly exciting; choosing a name, design, and publishing it is all part of the fun. Often people leave their domain name until last, trialling different names or finding one that’s available. When you create your website, you’re going to have to choose a web host. Why not choose a web host who gives you a free domain name? When you sign up to a host such as BlueHost, all of their plans include 1 free domain. With BlueHost you can choose from a wide range of domain name extensions. As well as being free, if you need suggestions or any help with your domain name, or the one you’ve chosen isn’t available, they’re happy to help. Packages start from £2.25/month but all include a free domain name! What’s more, if you’re not 100% sure on what you want your free domain name to be, you can wait until later. That’s right, BlueHost credit your account with a free domain so that you can claim it later – pretty cool right? Website builders offer a lot of options. If you don’t want the hassle of signing up to a web host and want your site hosted and designed within a few simple steps, you can use a website builder. Alternatively, if you’re happy with your web host but don’t want to think about designing your website from scratch, you can still use a website builder. That’s if you don’t mind a branded domain name. Signing up for a free plan with Weebly is really simple to do. And of course, the best part about it is that it’s free! Your website will be hosted for free with Weebly and you also gain access to a free Weebly sub domain. If you don’t mind your free domain name looking something like this: www.my-example.weebly.com then it’s a really handy option and a clever way of obtaining a free domain name. Other website builders like Wix offer even more options! 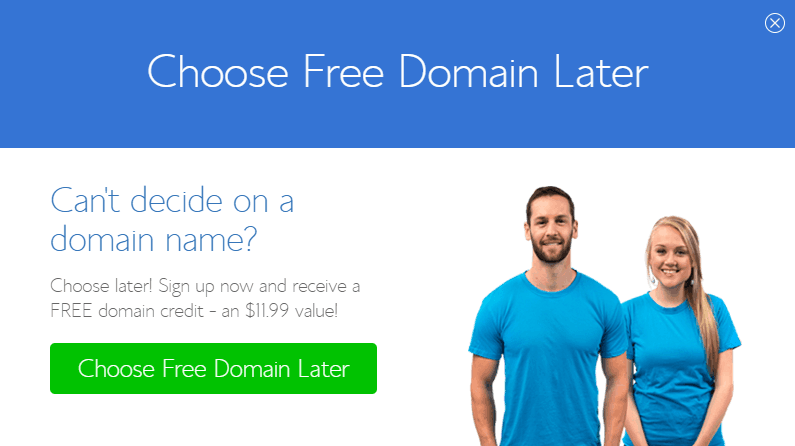 You can choose whether to connect your existing domain name if you have one, or you can obtain a 1-year free domain name with a paid plan. Would you be happy with a free .co.uk domain name for 1 year? Yes you would! 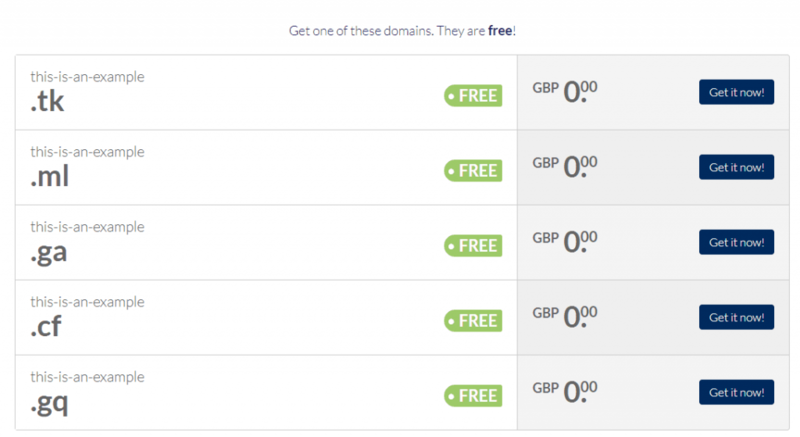 Namesco offers free domain names if they’re available. Follow these simple steps closely to obtain yours today. Once you’ve loaded the Namesco website, you’ll be presented with your domain name search. Simply enter your desired .co.uk name into the search bar and click continue to see if it’s available. Next, proceed to basket if you’re happy, or try a different domain name if you want to experiment with your options. At this point you’ll be presented with two options, simply select the first option. Don’t worry, we won’t actually be using the DIY website builder! 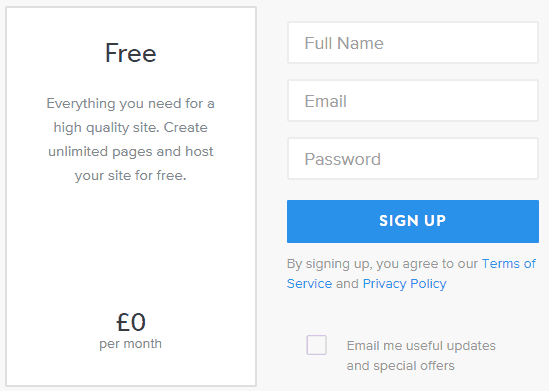 When you reach your basket, you’ll see the DIY website builder is charged at £6.99 for the first month. To continue with your free domain name, simply click on the red ‘x’ next to the website builder item to remove it from your basket. Voila! The pricey website builder has been removed, and your free domain name remains in your basket. You’ll be able to register your free domain name for 1 year and you’ll also have access to a free email too – yay! If you don’t want a sub domain from a branded website, and you’re not fussed about a specific domain name extension, head over to Dot TK. The same method applies, enter your desired domain name to see if it’s available. Whilst a .tk domain name may not be as recognisable or as popular as .co.uk or .com it’s absolutely free for 1 year. Although you can’t select your free domain name for longer than 1 year, there’s a good chance your name will still be available after this period. It’s easy to re-register a domain name, but if you want to be sure, you can pay the small fee. If you own or plan to own a U.K. based business, having a .co.uk domain name should be an essential item on your list. Once you’re committed to your business, there’s no doubt you’ll need a domain name for longer than a year, so this is where this offer comes in handy! You’ll want to make your way over to 123-reg in order to get your first year of domain registration absolutely free. As with any domain name website, simply enter your desired domain name to get started. As long as your domain name is still available, you’ll see that purchasing your domain name for 1 year is completely free, like I said! Once you proceed to checkout, you’ll see that 123 reg has applied your 1 years’ free domain name discount to your basket. As long as you’re in this for the long-term, this is a great deal. You’re essentially getting 1 years’ free domain name registration, or 2 years for the price of 1. So, there you have it, a great selection of places for you to get your free domain name today. If you’re not fussed about your domain name’s extension, I’d highly recommend Dot TK for their absolutely free service. If you want a website builder alongside your domain name, Weebly’s free plan will give you this option with a branded sub domain. For those of you who already have a web host and website in place, but simply need a free domain name, Namesco is a bit of a no brainer! Yes it feels slightly cheaty in the way that they present their options, but at the end of the day it’s still free. If you know that you’ll be keeping your website for the foreseeable future, 123 reg is a solid company who currently offer 1 years’ free domain registration when you sign up for 2 years. Alternatively, if you’re starting from scratch, I can’t recommend BlueHost enough! They offer cheap, reliable web hosting and all of their plans come with a free domain name for 1 year.